Next Round of International iPhone 4 Releases Set for July 28th? 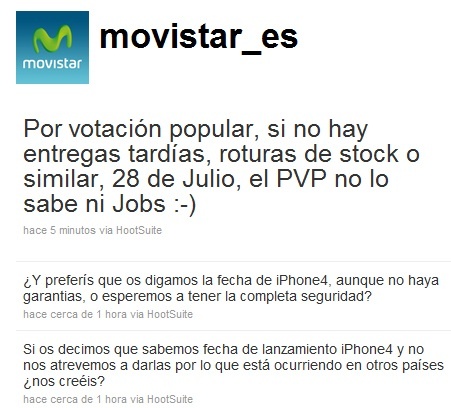 Actualidad iPhone reports [Google translation] that Spanish mobile carrier Movistar has issued a series of tweets indicating that the iPhone 4 is set to launch there on Wednesday, July 28th. While we can't say for certain that the announcement is anything more than speculation, as the Movistar representative does say that there is "no guarantee", the tweets do suggest that the device should be available by that date barring any unforeseen news or issues receiving stock. Furthermore, the representative notes with tongue in cheek that not even Steve Jobs knows the pricing information yet. Apple launched the iPhone 4 in the United States, UK, France, Germany, and Japan on June 24th and has announced that it is planning to launch in an additional 18 countries "by the end of July": Australia, Austria, Belgium, Canada, Denmark, Finland, Hong Kong, Ireland, Italy, Luxembourg, Netherlands, Norway, New Zealand, Singapore, South Korea, Spain, Sweden and Switzerland.